For years now, Christian movies have provided negative fodder for mainstream entertainment outlets and movie reviews. From criticisms about the overt gospel messages to heavy-handed critiques of the production value, faith-based films have rarely caught a break. But Woodlawn has done what some have deemed impossible: The latest Erwin Brothers offering has won over both Christian audiences and the critics! After a solid opening weekend at the box office, movie goers had high praise and gave the film an A+ CinemaScore rating, the first ever for a Christian film, and the first overall since critically acclaimed box office hits Selma and American Sniper. On the movie site Rotten Tomatoes, Woodlawn scored an average 4.5 out of 5 for a 91% fan rating. Even more surprising has been the positive feedback from reviewers. Of the “Top Critics” on Rotten Tomatoes, 100 percent gave the film a “fresh” review. Don’t take their word for it. 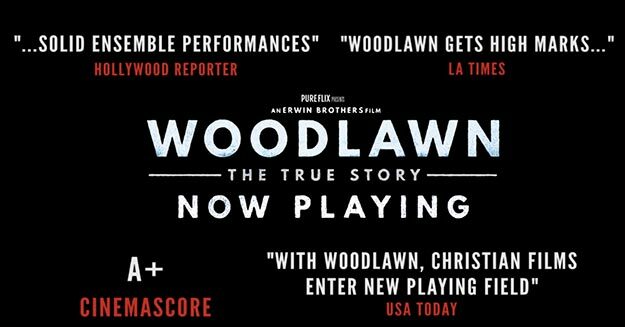 Go see for yourself why fans and critics alike are raving about Woodlawn. Check out the theater listing below, grab your friends and family, and experience one of the most inspiring true stories ever told!